8. Q: What if you live in Tel Rumeida and you have a heart attack ? At 5pm today, May 28, 2006, Palestinian workers from the nearby settlement of Modi’in Illit called Abdullah Abu Rahme, from Popular Committee Against the Wall and Settlements of Bil’in, to tell him there was huge fire at the outpost. Abdullah went quickly to the outpost and found the army, the police, ambulance, and a fire truck there. He found one of the structures at the outpost burned down. The outpost is two structures built by the people of Bil’in on their land that is separated from them by the Annexation Barrier and is near the settlement of Matityahu Mizrakh. It is an important site for the non-violent joint struggle between Palestinians, Israelis, and internationals. The people of Bil’in with Israeli and international peace activists have maintained a 24 hour presence at the outpost for the past few months. Today while Palestinian and international activists went to get food, the outpost was attacked. The workers did not see who started the fire, but people in Bil’in suspect that settlers started it because last week people of Bil’in were harassed as they attempted to talk with settlers. The settlers were moving in to Matityahu Mizrakh settlement despite the Supreme Court injunction forbidding it. And three months ago, settlers attacked people with stones when they attempted a conversation with the settlers about the illegality of their presence in the settlement. The police filed a report of the arson and said they will begin an investigation. Report by Shai E. and Matan. Translated by Rann B. On Friday the 26th of May 2006, about six jeeps belonging to the border police unit and gunner unit that is currently serving in the Macabim division drove around the village of Budrus firing in every direction. The forces fired tear gas, rubber-coated steel bullets and sound bombs. Almost every point in the village received a gas attack and there was nowhere to escape to. We and an international friend were on the roof of a building visiting some friends. After a few failed attempts to communicate with the Ramallah area District Coordinating Office (DCO), Matan called Dov Chanin, a Knesset member from the Hadash party. Eventually, a decision was made by the commander of Macabim division to remove the forces from the village. As the forces were on their way out they shot two tear gas canisters into the house we were in. We sat in a small room with around five children, aged 2-10. The house was dense with tear gas and the children were crying. It was very difficult to breathe. The father of the family decided to take the children outside. He, his wife, and a family friend went outside with the children. The soldiers shouted to us “Get out of the house or we will blow it up!”. We went down the stairs – everyone who went was beaten by the commander (a Druze Border Police officer) and thrown against the wall with his or her back to the soldiers. We were forced to our knees and ordered to put our heads down. “You will be humiliated this evening,” they said to us, “came to say a Sabbath blessing in the village? We will say a mourning prayer over you”. Matan was recognized as the guy from Beit Sira who had been shot in the eye with a rubber-coated steel bullet (one soldier even apologized to him a little), and I as a participant of demonstrations in Bil’in. To our non-Israeli friend, they claimed I throw stones in Bil’in. Our IDs were checked. The international was interrogated in English and at one stage a rifle was aimed at his head, with a canister containing a number of rubber-coated steel bullets that fire simultaneously. I shouted at them that they should point the rifle away and got another beating. They asked us if our mothers know what we’re doing. I asked them the same and they said “of course!”. I said that she probably isn’t very proud. They asked “who?” and I said “your mother”. I got kicked twice and they shouted at me not to talk about their mothers. When Matan told them there was an order from the commander of Macabim division that they exit the village, they got very angry and pushed his head against the concrete wall of the house, at a point with barbed wire. Throughout the entire incident, the soldiers refused to identify themselves. After about half an hour they got into their jeeps and drove off. They left the village at about 9pm. The trauma suffered by the children of the village is clearly visible on their faces and is evident by their nightly crying. These are innocent children whose streets are flooded every few days with dozens of soldiers who turn their village into a war zone. The so-called IDF is a terrorist organization. Youth from the Tel Rumeida settlement spat on, beat, assaulted, and stoned human rights workers from Canada, Denmark and Sweden yesterday (May 27, 2006). 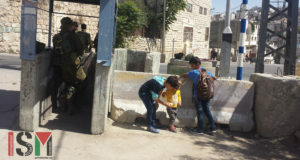 In three separate attacks on internationals and Palestinians the kids were encouraged by adults of the religious extremist Jewish community. Israeli soldiers and police refused to do anything to stop the violence. These attacks occur almost daily in Hebron but on Shabbat they are more frequent and in the last few weeks have become more violent, sending more than two internationals to the hospital. Yesterday afternoon, on Shuhada Street in the H2 area of Hebron, Jewish Canadian human rights workers Peter Trainor, of Toronto, and Canadian Chris Johnston were filming settlers throwing stones at the Palestinian Qurtuba Girls School. Two women, about 18 years of age, then tried unsuccessfully to rip Peter’s video camera out of his hands. About 10 boys, aged between 8 and 18, threw stones as well as kicking and hitting them. The soldier posted nearby, who was just a few meters away, did nothing to stop the stone throwing despite Peter’s calls for help. Instead he left the scene completely. An adult settler with an assault rifle approached and encouraged the children to keep stoning them. At about the same time, Danish human rights worker BJ Lund was harassed and spat on at the top of Shuhada Street. The soldiers watched the event and agreed that it wasn’t OK, but when BJ asked why they had not intervened, they gave no answer. Later that day Anna Svenson from Sweden, Chris, and Peter were attacked by a group of about ten male youth between the ages of 8-15 as they walked down Shuhada Street. The youth spat on them, hit Anna in the face, and taunted the soldiers who reprimanded the youth for spitting. A group of soldiers stood between the internationals and the youth, but the youth just threw the stones over their heads. When the police arrived, they threatened to arrest Anna and Peter if they didn’t leave the area. Human rights workers are stationed in Hebron to make sure that Palestinian children are safe as they go to and from school past the Tel Rumeida settlement. The settlers regularly throw rocks at the children as they walk past and have told soldiers to put razor wire across the beginning of a path that leads to Palestinian homes. The children have to move the wire out of the way every day. There is an Israeli Supreme Court order that allows the children to use this path but soldiers on duty nearby rarely know this and often refuse to help the children get home safely. At today’s demonstration in Bil’in, on May 26th, Israeli soldiers once again deliberately targeted peaceful demonstrators. As demonstrators attempted to cross razor wire, heading for the Bil’in village land annexed by the Israeli barrier, the soldiers threw sound bombs and tear gas grenades directly at them, causing several injuries. This violence was unprovoked by any stone throwing. The demonstration had started with about 100 Palestinian, Israeli, and international protesters singing and chanting. They headed towards the gate the Israeli military has installed in the annexation barrier. The theme of the demonstration was a call for unity between the Palestinian factions. A banner carrying the flags of the main Palestinian political factions was carried, with a large Palestinian flag above them all as a message that unity against the Israeli occupation is above political differences. When we go there, the way was blocked by two of the soldier’s jeeps, and a large group of soldiers in riot-gear. Attempts were made to pass, but the soldiers prevented this with their clubs and the jeeps. After about 10 minutes of trying to get past in this way, the demonstrators started to walk along the fence. When they got to a section in the barbed wire that was less thick than the rest, they started to calmly lay rocks and scrap metal on in so they could pass onto the military road that the military have ripped-up from the land of Bil’in to install. The demonstrators intended to pass to access the stolen village land. This was prevented by several soldiers in riot-gear who arrived quickly. The demonstrators did not have the numbers for another attempt at crossing which may have been successful while the soldiers were busy with the first attempt. After about 5 minutes of attempting to cross in this way, the soldiers got fed up and started bombarding the demonstrators with sound bombs and tear gas. They were aimed directly at the peaceful protesters, hitting several and causing injuries. They threw so many that it seemed they were going to continue throwing sound bombs and tear gas at the demonstrators until they all left. One Palestinian had been arrested though, so the demonstrators stood firm until he was released. Three international activists from Germany, Sweden, and the US were injured by soldiers who threw tear-gas canisters directly at them. 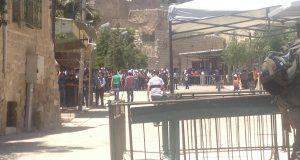 One was admitted to hospital in Ramallah. At least two Palestinians were shot with rubber bullets – one 17-year old was hit in the head. We visited two groups of people whose livelihoods have been demolished by Israeli military bulldozers the night before. 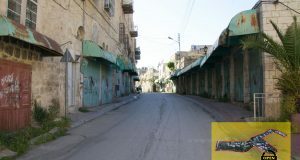 The military has issued demolition notices to all the business and homes 150meters from this road in Beit Ummar, saying that they needed to protect the settlers and these buildings posed a security risk. They also accused them of building without a permit, which in some cases is true because Israel rarely grants permits to Palestinians even on land that they own. Habess had papers proving that he owned the land and had a permit to build. When the bulldozers came in the night, however, and he told the commander of the 60 soldiers who showed up that he had a lawyer, the commander told him, “Let your lawyer sleep” and then proceeded to level the building. As we stood near route 60 on the rubble in his lot brooding and feeling helpless, three army jeeps drove by heralding the approach of about 200 settlers on bicycles. It was the holiday of Jerusalem Day, which is the celebrates the capture of Jerusalem in 1967, and entails parading through Arab neighborhoods in Jerusalem wearing Israeli flags. These settlers wanted to do some parading of their own, donning the Israeli flag and something not as accepted in Jerusalem: there were about three of the young guys wearing M-16, army issued, strapped to their backs. Some young women yelled at us and the Palestinians, “You are all donkeys!” and we laughed, because of the way she acted, it seemed obvious and pathetic that she was scared of us even though we just stood there. The settlers are like a branch of the military, their presence makes it easier for the military to be there and their undercover violence towards Palestinians is unchecked by the military. I had a pretty bad case of stomach flu for the last few days and was reluctant to even try to go to the doctor because it meant leaving Tel Rumeida on foot, as Palestinians are not allowed to drive cars here. Not even taxis, buses or ambulances. The entrances to the neighborhood are blocked off by checkpoints and roadblocks. Settlers are, of course allowed to drive cars, buses, taxis, ambulances and can leave the neighborhood through settler-only roads that Palestinians are not even allowed to walk on. I had decided it might be better to just stay in bed than to try to walk out and catch a taxi but then some friends came over and told me they had a car parked at the roadblock outside Tel Rumeida and would take me to the hospital. It was at night so the temperature outside was not so dreadfully hot and I decided it might be a good idea to at least get some fresh air. As we were walking to the roadblock, about a quarter of a mile away from where I live, I asked my friend “What happens here when someone is really sick and cannot walk to the checkpoint or to one of the roadblocks ?” He told me that they have tried to call for ambulances to come in here but they are not allowed. Last year his uncle had a heart attack. They had to carry him out to the checkpoint where an ambulance was waiting. But by the time he got to the hospital, he was already dead. So that was the answer to my question. At first I was reluctant to go at night because it meant going to the emergency and stomach flu was not an emergency and I didn’t want to get in the way of people who were really sick, but my friend said, no it was ok and not to worry. I was expecting to wait like 4 hours like you do when you go to the emergency at night in the United States. What happened when I got there shocked me. I literally did not even sit down in the waiting room. I was seen immediately but two nurses and a doctor. They did a blood test and gave me an injection. I was in and out in about 40 minutes (the blood test took half an hour to process). Total cost for an uninsured foreigner ? This is of course if you can make it out of the Israeli controlled part of Hebron into the Palestinian controlled part without dying first. So, Americans.. you go to the emergency with no health insurance, get a blood test and an injection.. I think it would be safe to say that you can count on paying minimum $400 for this. This is democracy ! We can give billions of dollars to Israel and spend God knows what on a war in Iraq but we cannot afford to give all our citizen health insurance.